I wish you were here. 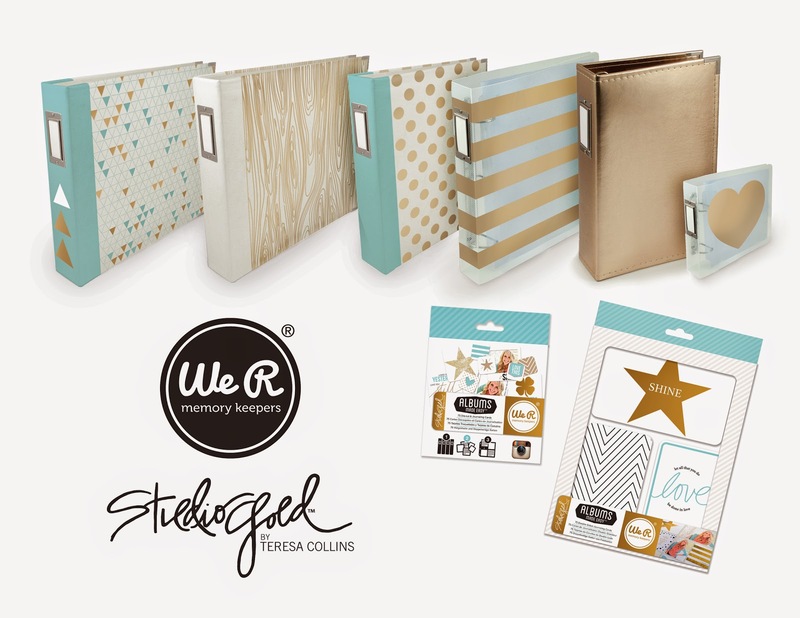 I just debuted BRAND NEW Teresa Collins STUDIO GOLD photo ALBUMS and GOLD FOILED card sets. I am THRILLED to announce and show you that I have done these beautiful albums with We R Memory Keepers & Albums Made Easy. I just barely got my hands on these at the show. They are TOP quality. I designed the albums with gold book plates and yes, there are TC STUDIO GOLD cards to go with these beautiful books. These will be available next month. You can place orders NOW directly from WRMKs. I would LOVE to know your favorite. I have done two brand new 8.5x 11albums ( gold dots) and the (white with gold foiled cabana stripes). I know that this is a size that is not being done. I knew that many people want smaller photo albums. They are stylish, smaller and appeal to a entirely different market. I love them! They come with photo sleeves designed for your photos and cards to slide into. They are gorgeous. I am in HEART... total love with the clear with GOLD foiled cabana stripe too. I also have TWO- 12x12 albums in both the gold foiled woodgrain (amazing) and the triangles. They are both so pretty and I have an entire card set of glittered and foiled cards. They are just beautiful. I am THRILLED... JUMPING up and down thrilled for my 6x12 gold album. The size is perfect. They hold your 4x6 photos and cards in a stylish and GOLDEN way. ha! Now don't forget my little ADORABLE 4x4 (clear with gold foiled heart) album. Yes, I have a card set that coordinates with the 4x4 and 2x2 AME card sizes. Yes, it's just a little too good to be true. I am quick HONORED that I have had retailers tell me over and over that my albums are so different than anything they have ever seen in the album market. They loved them and I was so happy that others got my vision. I was definitely doing another HAPPY album dance. Just kidding... no time for dancing but I definitely have been smiling from ear to ear. This is exciting. I knew that I needed to follow my heart and instinct when others questioned me doing the 8.5 x 11 and 6x12 designs. Would consumers want this size? I knew that sometimes you have to follow what you KNOW and that instinct....and it has paid off. I could not be happier. The gold FLIP BOOKS are just like my other FLIP books but they are GOLD foiled and amazing!!!! How cute is my 4x4 clear with GOLD foil heart on the cover? This is the original digital mock up. WRMK are fabulous... yes, they are GREAT partners. I wanted to show some UPCLOSE photos of the albums in the booth. I can't pick my favorite... I just can't. and high end wedding invitation designers who have fallen in love with my lines here and my GOLD albums. I am just so honored to be here. who have welcomed me and ordered my products. produced before. It's been a dream come true. This is the perfect fit for me and my company and what I love to do. I LOVE IT!!!!!! I am hooked and here to stay. These are simply wonderful and just in time for our middle daughter's wedding pictures! Here's to an amazing collaboration of design and craftiness! I am over the moon excited!! I can't wait to see what's next. I love that you're showing everything in phases! Looking forward to the craftwell announcement today! You GO girl! People think I'm crazy that I ONLY buy your paper and products. I Picked a winner! God Bless! Love all of these, and will buy them as soon as they are available! I can't wait for these to be available! LOVE that clear one with the golden heart...Hearts are my thing:) Your colors you chose are STuNNING!!!! Very nice and so wonderful for you! Glad to hear it is going so well! Wow, So happy for you. I am glad that the launch of your new products have been so well received. Now they know what we all who have been following and using your products for years know. Everything you offer us is beautiful. How gorgeous are these? I am totally over the moon for them! Can't wait to get my hands on them! LOVE LOVE the dots! I love the color combo..the gold is terrific! Gorgeous!!! Wish they'd been available months ago for my daughter's wedding - her colors were navy and gold. OMGOSH OMGOSH OMGOSH!!! STUDIO GOLD!!!!! These albums and cards are FANTASTIC! I want them all!!!!!! OMGOSH OMGOSH OMGOSH!!! This is just FANTASTIC!!! You are the best! Oh.My.Word!!! Talk about jaw-dropping beautiful!!!!!!!!!! A gal just asked our local LSS for these, and as soon as they ship to Canada, I'm getting my hands on these! !